Earthquake damage at Copperfield's in Napa, Calif. Yesterday's early morning earthquake centered in Napa, Calif., north of San Francisco, affected at least two bookstores--the Copperfield's branch in Napa and Napa Bookmine--and caused many books and sidelines to be tossed on the floor but no structural damage. Lindsay McConnell, manager at Napa Copperfield's, called the store "a big fat mess," reporting that more than 70% of the store's books were on the floor, calendar and card racks flipped, and some sidelines like mugs, candles and jars were broken. The store, which had power turned back on relatively early, was closed yesterday for cleanup. Vicki DeArmon, Copperfield's marketing and events director, said that at the Copperfield's store in Calistoga, which is in Napa County, just a few books fell off the shelves. At the other five Copperfield's stores there was no damage. 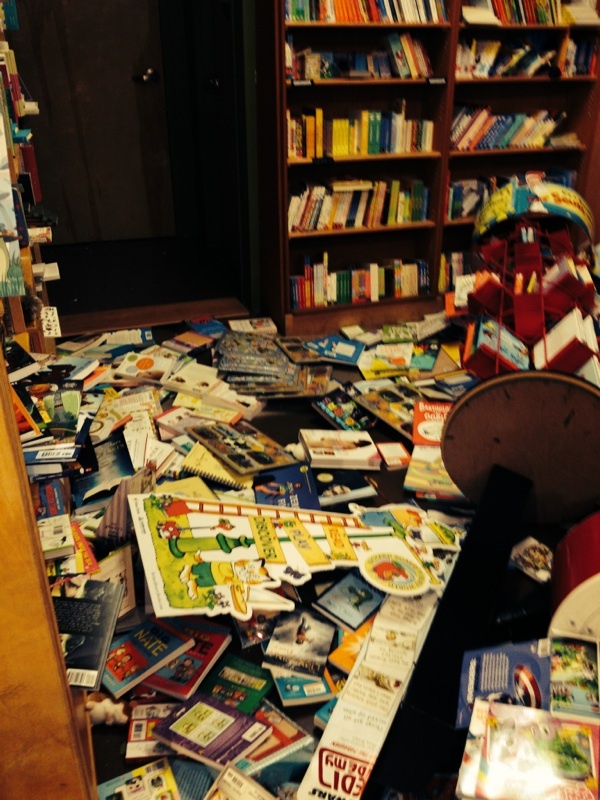 On Twitter, Napa Bookmine said that "lots of books" were on the floor but that there seemed to be no structural damage. On Facebook, the store said yesterday that some "seriously helpful volunteers" were helping put the store back together, and posted a short video of the quake aftermath. The store is open for business today. Waiheke Book Festival is back!